Discuss the Congressional plan of Reconstruction and show HOW it developed out of the weaknesses of the Presidential plan. Because of the dissatisfaction of the Presidential plan of Reconstruction, the Congressional leaders developed a plan of their own which carefully retained control of the entire process of Reconstruction in their hands. The Congressional plan got started with the passage of the Wade-Davis Bill of July 1864. The bill was a response to Lincoln's plan of Reconstruction and a reflection on the Radical Republicans who sponsored the bill and felt Lincoln was too lenient. The bill stipulated that Congress and not the President was to have jurisdiction over the process of Reconstruction . Republicans of all shades feared a revived Democratic party and many in Congress resented the wartime expansion of executive power by Lincoln with his pocket-vetoed the bill. This started a rift over Reconstruction between him and that wing of his own party called Radical Republicans The term Radical Republican refers to those who were determined to employ the power of the national government to insure civil and political rights for the newly freed Blacks. The Radicals also wanted to establish the supremacy of the Republican party in national politics and the supremacy of Congress in the federal government. Though at first small during the Lincoln years, the Radical faction during the latter part of the Johnson administration managed to dominate the Republican party. "The Southern states ought never to be recognized as capable of acting in the Union, or of being counted as valid states, until the Constitution shall have been so amended ... as to secure perpetual ascendancy of the party of the Union." The party was the Republican party and the Amendment was the Fifteenth, passed in 1870. The Amendment provided for suffrage for the Blacks which in tum accomplished two things: It fulfilled the moral obligation to the Blacks and satisfied the humanitarian and liberal wing of the Republican party . It also created a flourishing Republican party in the South. The reason for Stevens' comment was that, if the Southern states returned a solid Democratic counterpart to Congress, as appeared inevitable under Lincoln's Reconstruction plan, a reunited Democratic party would win the next presidential election and possibly have a majority in both houses of Congress. Hence, the stage was set for conflict between the Presidential and Congressional plans of Reconstruction and a motive to remove both Lincoln and Johnson from office becomes clear. On December 4, 1865, Congress met for the first time since the Lincoln assassination and since Johnson had been in office. At that time Congress refused to endorse Johnson's Reconstruction efforts; consequently, they formulated a joint committee of 15 from both Houses of Congress to examine the issues of suffrage and Southern representation. As a prerequisite to readmission to the Union, the Southern states had to guarantee the Black man the right to vote and hold office. Ex-Confederate leaders were to be disqualified from holding office . The Southern states had to repeal their Black Codes. Finally, Congress felt it had the power to reconstruct the ex-Confederate states as the both Presidents Lincoln and Johnson were not protecting the rights of the Blacks and were giving away the fruits of victory. When the Southern states proved unresponsive, Congress passed the Civil Rights Act of April, 1866, over the veto of Johnson. The act declared that Blacks were citizens of the United States and forbade states to discriminate among their citizens because of color or race as they had in the Black Codes. From this point on, Congress and not the President was in control. Like the Civil Rights Act of April 1866, the Amendment was designed to guarantee the civil rights of Blacks against unfavorable legislation (Black Codes) by the states. The Amendment accomplished this by defining national citizenship to include Blacks. It also threw the protection of the Federal Government around the rights of Blacks, rights which might be violated by the states. The significance of the Amendment was that, for the first time, the Federal Government took upon itself the protection of the rights of life, liberty, and property of the individual. These were rights that a state could not invaded. which from the beginning distinguished our federal system. When ten of the former Confederate states refused to ratify the Amendment, Congress was left with no alternative but to take more drastic measures to protect the rights of Blacks. As a result of the friction between Johnson and Congress in 1866, the congressional elections of that year gave the Republicans two thirds of each house, giving the Radicals effective control of Reconstruction. The opposition to Johnson, and the recent congressional election resulted in a series of far-reaching measures being passed. These important measures, collectively called the Reconstruction Acts of March 1867 nullified the whole Presidential plan of Reconstruction. In 1867, Congress passed the Reconstruction Act, which EDWIN STANTON, as Secretary of War, was charged with enforcing. Johnson opposed the Act and tried to remove Stanton — in direct violation of the TENURE OF OFFICE ACT. Nine of the articles of impeachment related to Johnson's removal of Stanton. Another two charged Johnson with disgracing Congress. Johnson's defense was simple: only a clear violation of the law warranted his removal. The most important of these was called the First Reconstruction act of March 2, 1867. The act declared that no legal government had existed in any state except Tennessee. It also divided the territory of the South into five military districts subject to military commanders who were charged with the responsibility of protecting life and property throughout their districts. To get out from under this military regime and to re-establish their rights , each state would have to provide, by universal male suffrage, a new electorate and constitutional convention. This convention would set up a government based on black and white suffrage. It was also necessary for the new state legislatures to ratify the Fourteenth Amendment. Thus, by March, 1867, military rule replaced the civil government in the South which had been operating for over a year under the Presidential plan of Reconstruction. Consequently the Presidential plan came to an end. The principal task incumbent upon the military commanders was the creation of new electorates and the establishment of new governments . This new electorate was made up of a coalition of three groups: Blacks, Carpetbaggers, and Scalawags. Blacks held few offices during Reconstruction. With a few exceptions Blacks never shared in the spoils of office in proportion to their numbers. Carpetbaggers were Northerners who had returned to the South to farm, businessmen looking for good investments, and government agents who, for one reason or another, decided to stay on in the South. Scalawags made up the largest single element in the Radical coalition. They were Southern planters, merchants, and industrialists who turned Republican. They were also willing to cooperate with the Blacks and Carpetbaggers to advance their own interests. Through the power of pardon former Confederate officials may vote and hold office. After the legislatures of the reconstructed states had ratified the Fourteenth and Fifteenth Amendments, Congress formally readmitted them to their NORMAL relationship in the Union by seating their elected Representatives and Senators. As soon as the supremacy of the new governments appeared reasonably secure, Congress withdrew the military governments. Thus from 1867 to 1877 the Radicals controlled most of the reconstructed states of the South. Their aim was to ultimately establish congressional supremacy in the American governmental system through the Reconstruction Acts of March 2, 1867 and by their impeachment of Johnson in February, 1868. Some of the acts which Congress passed in order to carry into effect its Reconstruction policy were most likely unconstitutional, but the attitude of the Radicals was well expressed by General Grant when he said of the legislation "much of it, no doubt, was unconstitutional; but it was hoped that the laws enacted would serve their purpose before the question of constitutionality could be submitted to the judiciary and a decision obtained." 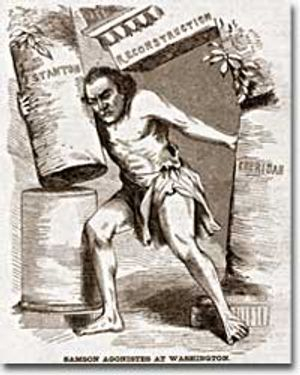 There was one major weakness in the First Reconstruction Act which the Radicals and Congress took care of with the second Reconstruction Act of March 2, 1867, called the Command of the Army Act. The Command of the Army Act. required that the President issue all military orders through the General of the Army (U.S. Grant). Because the First Reconstruction Act divided the South into five military districts, the President would technically be in charge of Reconstruction . Also on March 2, 1867, Congress passed the Tenure of Office Act which prohibited the President from removing officials from office was he had appointed with the approval of the Senate. 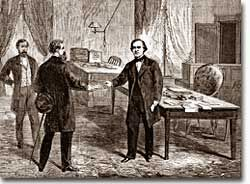 After Johnson dismissed Secretary of War Stanton from office in February 1868, Congress voted for impeachment. The House of Representatives drew up 11 Articles of Impeachment, including alleged violations of the Tenure of Office Act, the Command of the Army Act and with attempting to bring disgrace and ridicule upon Congress. By one vote Johnson avoided conviction and removal from office as seven Republican Senators broke with the party leadership and voted for acquittal. ( Johnson's impeachment proved to be an important turning point in our history , for had it succeeded, the Radicals would have established the principle that Congress may remove a President not for "high crimes and misdemeanors" as required by the Constitution, but for purely political reasons. The Compromise of 1877 which came as a result of the election of 1876 brought an end to political Reconstruction .